The following document was originally published by the website OODA Loop in April 2016. (U//FOUO) This joint DHS and FBI Assessment examines the possible reasons why anarchist extremist attacks in certain countries abroad and in the United States differ in the frequency of incidents and degree of lethality employed in order to determine ways US anarchist extremists actions might become more lethal in the future. 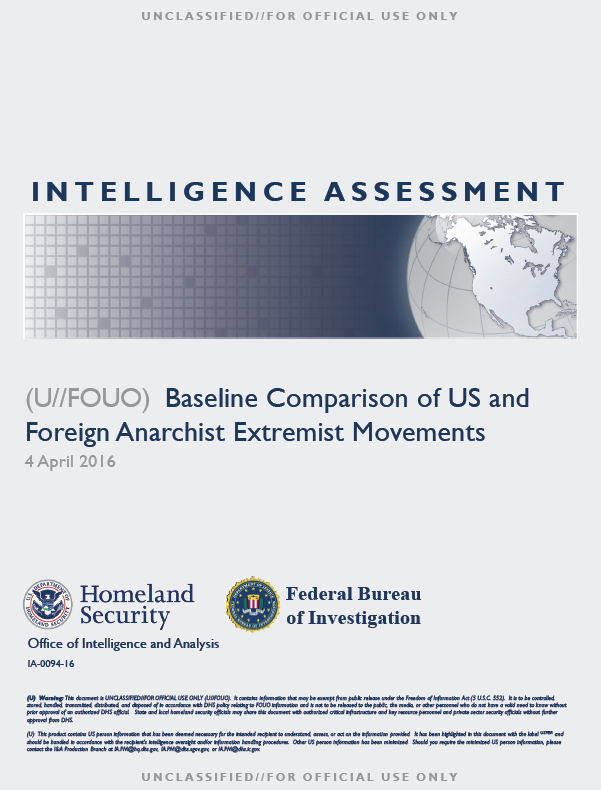 This Assessment is intended to establish a baseline comparison of the US and foreign anarchist extremist movements and create new lines of research; follow-on assessments will update the findings identified in the paper, to include the breadth of data after the end of the reporting period (as warranted by new information), and identify new areas for DHS and FBI collaboration on the topic. This Assessment is also produced in anticipation of a heightened threat of anarchist extremist violence in 2016 related to the upcoming Democratic and Republican National Conventions—events historically associated with violence from the movement. 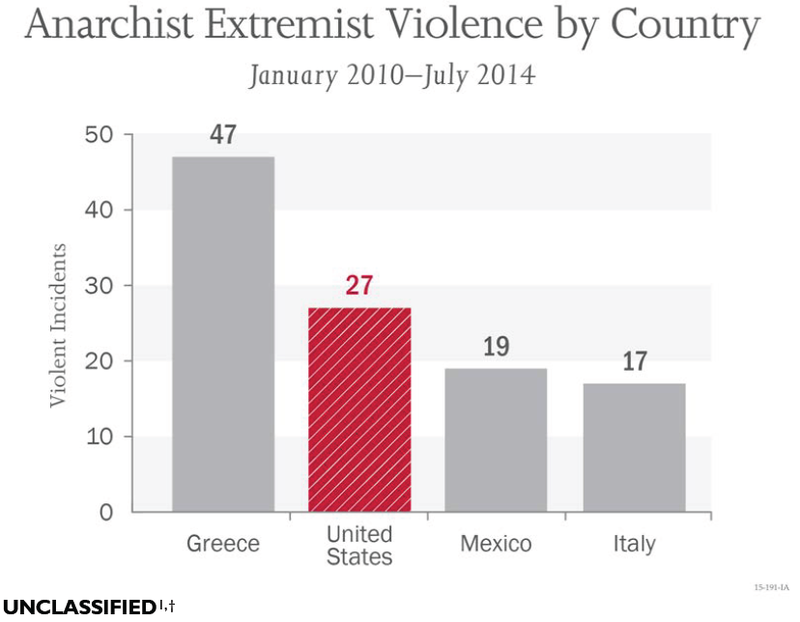 By comparing violence in the United States with Greece, Italy, and Mexico—countries historically exhibiting anarchist extremist violence targeting persons—from January 2010–July 2014, we identified factors that could explain differences in targeting and tactics by selected foreign anarchist extremists and United States. The study examines 110 anarchist extremist incidents occurring within the United States and these selected foreign countries. Only those incidents determined to be violent (i.e., involving threats of bodily harm) were included in the dataset. Our ability to analyze relevant details of attacks depended heavily on the quality of sourcing for these incidents—which almost solely derived from the media. Additionally, although US anarchist extremist attacks noted in this study occurred in multiple states, the majority of incidents occurred in the Pacific Northwest region. (U//FOUO) This Assessment was produced to assist federal, state, local, and tribal government agencies and private sector infrastructure and security officers in the deterrence, prevention, preemption of, or response to terrorist attacks against the United States conducted by anarchist extremists. Some of the activities described in the study may involve activities that are, by themselves, lawful or constitutionally protected, and the study’s findings should be considered within the existing framework of laws, regulations, and operating procedures that govern a particular enforcement entity. Additionally, conduct deemed potentially suspicious and indicative of terrorist activity should be taken in conjunction with other indicators and possible preoperational activity. 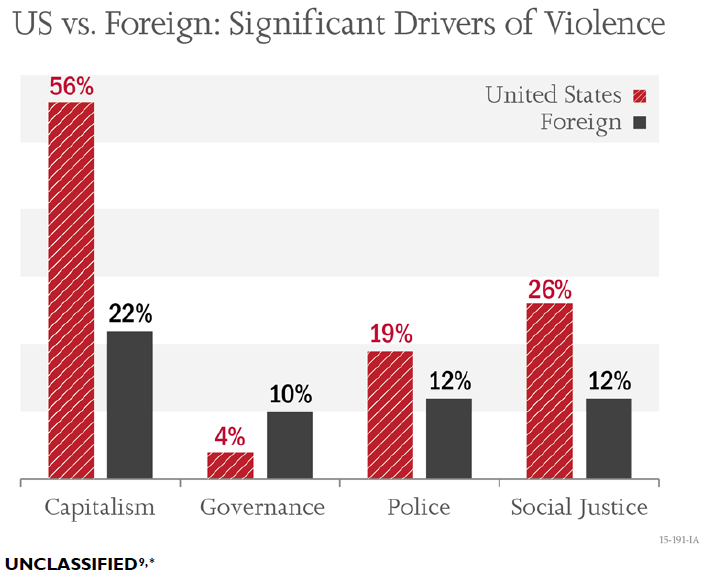 » (U//FOUO) DHS and FBI assess the primary factor explaining the difference in targets between foreign and US anarchist extremists is foreign anarchist extremists’ focus on specific economic and governance issues relative to their geographic area, while US anarchist extremists tend to focus on symbols of capitalism. We assess the likely primary factor explaining foreign anarchist extremists’ greater willingness to use more violent tactics than their US counterparts is that these foreign anarchist extremist movements are often more organized—allowing for more complex attacks—and have a well-established tradition of lethal violence not currently seen in the United States. » (U//FOUO) The vast majority of US anarchist extremist attacks targeted property likely due to the location’s accessibility and as a symbol of capitalism and globalization. Most foreign anarchist extremist attacks targeted persons likely because of the cohesiveness of the movement and greater emphasis on issues that can be blamed on local, individual targets. 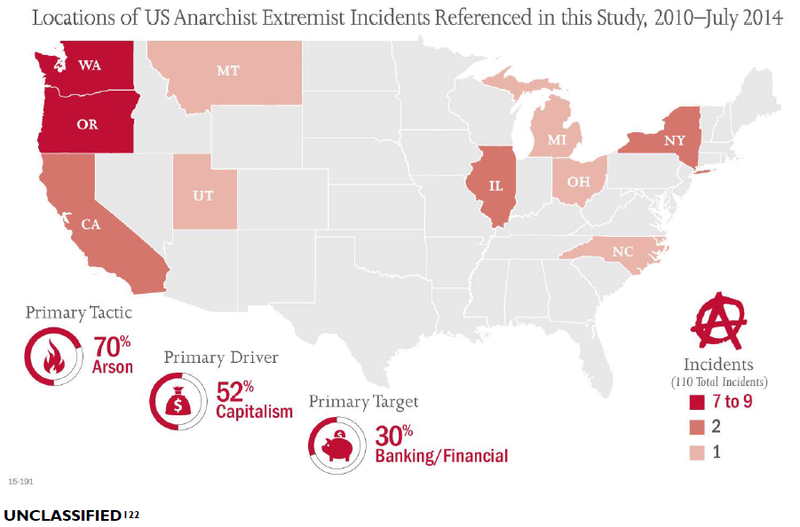 US anarchist extremists targeted the banking/finance sector most often, as these perceived soft targets of capitalism are possible to attack with tactics that are non-lethal yet cause significant economic damage and pose significant public safety risks. 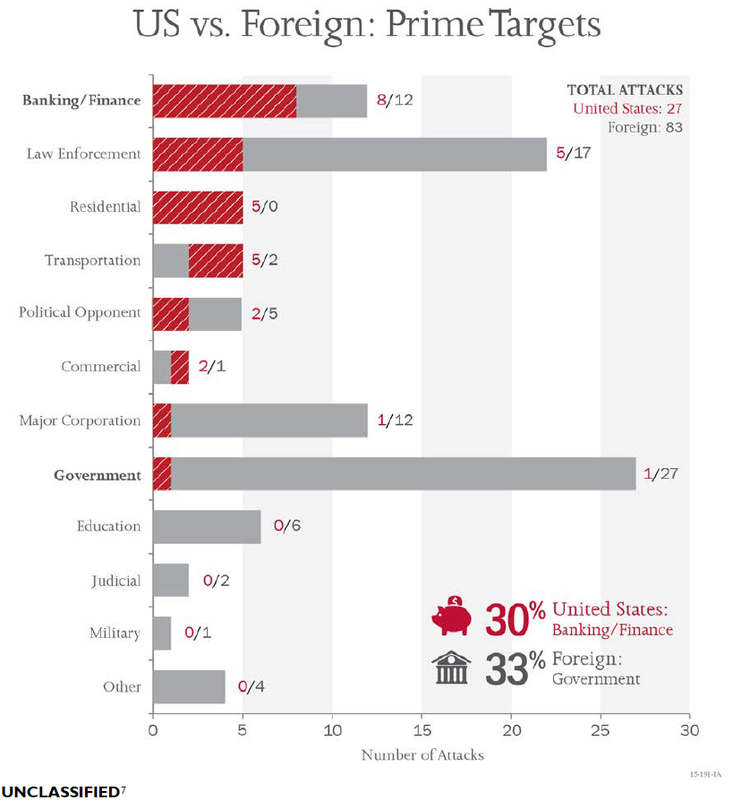 Foreign anarchist extremists most often targeted government entities, likely due to the emphasis placed on local domestic issues by foreign anarchist extremists and their capabilities to commit attacks against hardened targets. » (U//FOUO) Arson was the most common violent tactic used by US anarchist extremists—approximately 70 percent (19 of 27) of attacks—while foreign anarchist extremists used arson in only a third of their attacks. US anarchist extremists likely use this tactic based on their intention to cause economic and property damage, which can be accomplished by arson with relatively limited resources and specialized skills. Unlike US anarchist extremists, foreign anarchist extremists frequently used explosives, likely due to their capability to develop more advanced explosive devices as a result of their more organized structure, having a history of using such tactics, and because their targets are hardened. (U//FOUO) Social justice issues––specifically opposition to gentrification and opposition to perceived racism and fascism––were the second most common driver of violence for US anarchist extremists, as they accounted for 26 percent (7 of 27) of attacks. Social justice issues accounted for 12 percent of violent foreign anarchist extremist attacks, although these incidents occurred only in Greece and were all against perceived fascism. Although social justice issues can motivate anarchist extremists to violence, they are often a driver for violence if a social justice issue occurs within a location that also has an anarchist extremist presence. (U//FOUO) Social justice issues often result in legal protest activities, and historically, in both the United States and abroad, anarchist extremists have been known to co-opt legal protests as a cover to commit violence against their targets. However, a review of data in this study indicated in the seven social-justice motivated violent incidents committed by US anarchist extremists, only one of those incidents exploited otherwise legal protest activity. The reasons for this finding are currently a reporting gap. » (U//FOUO) Fascist, nationalist, racist, or anti-immigrant parties obtain greater prominence or local political power in the United States, leading to anti-racist violent backlash from anarchist extremists. » (U//FOUO) A charismatic leader emerges among US anarchist extremists advocating criminal activity and unifies the movement, possibly increasing motivation to commit violence. » (U//FOUO) Incendiary or explosive devices constructed by anarchist extremist(s) become more sophisticated. » (U//FOUO) Anarchist extremist(s) retaliate violently to a violent act by a white supremacist extremist or group. » (U//FOUO) Anarchist extremist(s) retaliate to a perceived act of violence or lethal action by law enforcement during routine duties, creating a martyr for the movement. » (U//FOUO) Anarchist extremist(s) with financial means travel abroad where they learn and acquire more violent tactics and return to teach others and/or conduct actions on their own. » (U//FOUO) Anarchist extremists acquire or arm themselves with legal and/or illegal weapons. » (U//FOUO) Multinational corporation or bank becomes involved in public scandal, leading to focused targeting campaign by US anarchist extremists against the entity. » (U//FOUO) A successful US or foreign anarchist extremist event disruption such as at the 1999 Seattle WTO riots motivates copycat and/or follow-on actions domestically. » (U//FOUO) A foreign intelligence service attempts to foment US unrest by facilitating anarchist extremist violence domestically.